The rooster chimed in for the third consecutive morning two hours before wake up call. The early 5:30 wake up was filled with bittersweet endings as we prepared to leave Coto Brus and our wonderful host family. We received one last feast that consisted of eggs, rice and beans, cheese, fresh fruit, toast and avocado. After a delicious meal, we said our goodbyes to Ricauter and his family (including buster the dog, who…… stole everyone’s heart, but lost his…). We packed the bus and Ricauter sent us on our way with one last prayer in Spanish. It wrapped up our stay perfectly as we battled the language barrier all week, but still managed to learn and show God’s love to all we encountered. As we started our six hour journey back to AMCA, we were thrilled to hear that a quick stop at the beach would break up our travel. As we travelled through the vast mountain ranges we encountered many bumps and turns that dampened our opportunities to sleep. Thankfully the never ending, beautiful views of Costa Rica filled our minds with joy. We approached the coast and knew the beach wasn’t far. Randall (the driver that brought us across the country), steered us in the right direction, and we ended up at the beach safe and sound. We watched the waves crash in and explored the wonders of what lied ahead of us. Taking pictures, collecting seashells, walking through caves, and climbing rocks were the favorite adventures. Some of our more daring teammates: Cody, Luke and Jack, got a whistle from the lifeguard for wandering too far on the rocks (REBELS). After a team selfie, bathrooms breaks and sweaty armpits, we boarded the bus for the final leg of the trip. Everyone on our team is embracing their roles, the rooster included. He woke us up once again in the fourth hour. Coach Kust complemented the rooster with a false alarm much earlier than our expected wake up call. Luckily, a hearty breakfast awaited us, including some heavenly, fluffy pancakes. We then loaded ourselves and the equipment onto the bus and headed to our first school of the day. We would be remiss if we failed to mention the river we drove through to get there. Thankfully, our 90’s Isuzu bus, battle wounds and all, doubles as a World War II era tank. 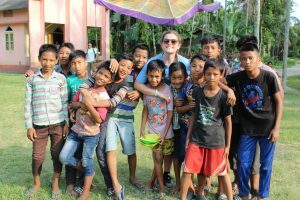 Once we arrived, we provided the school with clean drinking water in the form of two Sawyer water filters. 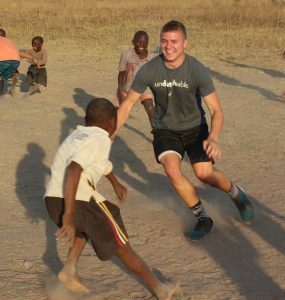 Meanwhile, the rest of our team began playing with the children. We split into two groups, one of which played soccer and the other wiffle ball. After a heartbreaking defeat to the local children in soccer, we bounced back for a rousing game of dodgeball, in which the children begged for mercy. Ha ha. Just kidding. But in case you were wondering, we won. We finished our time at the school with testimonies from two of our team members: Hailey and Heather. After some downtime and a nourishing lunch, we took a short hike to our second school of the day. Immediately upon arrival, it promptly started pouring rain in biblical proportions. Luckily, there was a large covered area ideal for some controlled chaos that challenged our ability to think on the fly. Without an outdoor space to play games, we managed to invent some new games to play with the kids. Even though the rain continued to fall, our spirits were lifted by the smiles of the children. We demonstrated setup and use of two more water filters and left them with one more for future use. We concluded our time with two more testimonies, this time from Sydney and Madison. Since it was raining, our bus driver came to give us a ride back from the second school. On our return trip, we happened upon a mudslide that left some rocks in the road. This gave us an opportunity to embrace the name of our sponsoring organization as we literally Push(ed) the Rock(s). Preceding dinner, we serenaded our gracious host Ricauter to the tune of Happy Birthday. We celebrated his birthday with an incredible dinner, which included smoked pork, mashed potatoes, fresh pineapple, salad, and yuca. We ended the night with a powerful testimony from Nattie during team time. We also continued our discussion from 1 John, keeping in mind that God is light and in Him there is no darkness. We were left with a question to consider: In what ways do we take sin lightly and how can we move forward into forgiveness? We are thankful for the relationships we have built in Coto Brus, and anticipate further growth and blessing as we return to San Jose in the morning. There ain’t no mountain high enough! Dark and early around 4am, the rooster woke the house up with its loud morning call. Our real wake up time was 6am and little did we know that after breakfast we would encounter a difficult yet rewarding hour and a half hike through the beautiful Costa Rican Mountains. The path winded and twisted on mud and dirt and was consistently challenging us to keep going in order to reach one of the local schools. The scenery of our hike was breath taking; seeing all of God’s work left us in awe! Once we arrived at the local school everyone realized that we were truly in the middle of nowhere. There was a large field of grass down a hill with three school buildings which were filled with smiling little faces. The kids were estatic to see us and to play sports with us for the next couple hours. Once we talked to a few of the locals, we found out that many of the kids at this school walked approximately an hour or two in order to arrive at school. After walking to the school this morning, we realized how difficult it is for kids in this region to receive an education. At the camp we broke the kids into three different groups and had a total of four stations which included: Soccer, dodgeball, penny tag, and wiffle ball. The kids were timid at first due to us being new faces and the language barrier, but after a little warming up the kids loved participating with us. After each group went through each station, we gathered as a group and had Hayley and Frankie share their testimonies with a translator. 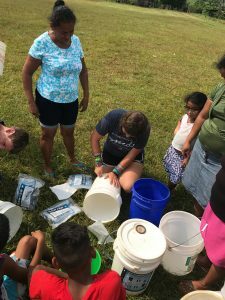 Along with the sports we played, we had three of our team members set up three water filters for them to use. We then said goodbye to the kids and thanked them for their participation and showing us their love. Once the camp was over in the morning we then had to hike alllllllll the way back, which was a downhill, muddy battle which led to some tumbles, a walk through a river (or fall *cough cough Hayley Reitsma*), and a walk over a bridge. After the long hike back we arrived home just in time for lunch and a break! After our little break we hit the hike path again to head to another local school (thankfully this walk was shorter!) We arrived and began to prepare for the sports clinic. In order for the kids to get warmed up to our team we played cat and mouse tag which the kids loved. Then we broke off in to groups with two stations that included: Soccer and wiffle ball. The kids were not engaged at first but with a little encouragement they started to participate more and more. Then we got together as a whole group and Matt and Julianna shared their testimonies. We also set up three water filters and left them four more to assemble later! We then hit the path again and walked home where we then had free time to shower due to how sweaty we were and had the opportunity to take a nap (which we allllll loved). After dinner we met up for team time and dove into 1 John specifically chapter 1 verses 1-4. We talked about the importance of having fellowship with God and each other. To conclude this exhausting yet rewarding day we are thankful for our host family and the amazing opportunity we have had to serve in Coto Brus! Posted on August 18, 2017 August 18, 2017 Author Melinda LarsonCategories Costa Rica 20171 Comment on There ain’t no mountain high enough! Prisons, buses and crocodiles, oh my! Our “Equipo de Esperanza” (Team Hope), as we have begun to call ourselves, started this morning with a prompt wake-up just before 6 am. We fueled up at the AMCA House (our lodging) with a delicious meal (as seems to be the usual around here) and then travelled in El Toaster (our bus) to La Reforma youth prison, where we split into two groups. 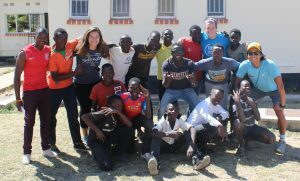 Our trusted tall athletes (also known as the men’s and women’s basketball teams) lead 5 youth in some basketball drills, while those of us who are more vertically challenged (the non-basketball players) taught a prison administrator and a guard how to use the Sawyer water filters. We went through multiple different basketball drills including ball handling, passing as we shuffled up and down the court, full court layups and lightening (also known as knock out). The game of lightening was a nail biter, but D Rose (one of the youth) was able to hold off our very own Luke Dreyer in the final round. The game of 2 vs 2 was also called “no blood, no foul” as well as our 5 on 5 game (Ticos vs Hope basketball). Hope pulled off the victory after an impressive and bold half court shot by crowd pleaser Jack Thompson. The youth then challenged us to a soccer game, which both the tall people and non-basketball players participated. The Costa Ricans won……we’ll just leave it at that. Our short friends had some fun of their own as well before hopping in to a good ol’ game of soccer. Our very own Hailey Houck and Matt VanDyken proved they listened during our on-campus training and flawlessly explained (translated one of our local Push The Rock staff, Nattie) not only the assembly of the filters, but also the purpose and maintenance. We also heard that sadly there is an illness that some of the youth have been contracting lately which could possibly lead back to contaminated water. After hearing that it was clear that God had elected this ministry of water to this place. After leaving the prison we headed back to AMCA House for a quick lunch and packing time. We departed at 1:10 pm en route to Coto Brus in a new, air-condition-less bus (goodbye until Saturday, El Toaster), and arrived at the guest house for Fundacion Piedad at 8:30 pm. 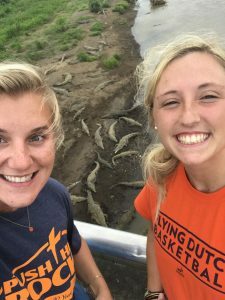 It was quite the ride, featuring an opportunity to pull over and see a group of about 30 crocodiles lounging on the side of a river together–some were in the river! Definitely a surreal moment, but we felt nice and safe above them on the bridge. Other van festivities included testimony sharing, snacks, more snacks, and a new running joke about I.T. Matt and Audit Cody (sorry, you had to be there). After we arrived and settled in, we were fed another delicious meal. We just had our itinerary prep meeting for tomorrow, and are all now looking forward to a good nights’ sleep! Hasta manana, Coto Brus. Posted on August 18, 2017 August 18, 2017 Author Melinda LarsonCategories Costa Rica 2017Leave a comment on Prisons, buses and crocodiles, oh my! Our first morning was spent at a youth prison near San Jose. We gave some basketball lessons and played some games. Most impressively, Cody dunked on the crooked outdoor rim that is closer to 11 feet than 10. We were able to demonstrate the water filter system to an administrator and a guard and we learned that they have been having some illnesses due to the water. We left filters to be placed in the cells and provide clean water for the youth. We are hitting road this afternoon to another region of the country where it is unlikely we will have internet access. Thanks again for your support!